Soup is not only tasty and nutritious but provides a hearty and warming meal that can be eaten at home or easily transported to work for lunch. With only a handful of ingredients required, this recipe is simple and easy to prepare and will make your kitchen smell heavenly. Does it get any better than that? 2. Place the ingredients on a baking tray, add the fat and a liberal sprinkle of salt. 3. Roast in the oven for about 30 minutes. 4. The squash should be soft and the peppers and onions soft and charred. 5. Don't worry if the onions are quite burned; they make a lovely garnish that way. 6. Once cooked, place all of the butternut into the blender and add the stock. 7. 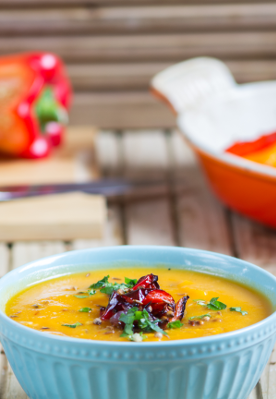 Blitz to a smooth puree. Add half of the peppers and pulse. 8. Make sure that they break down nearly all the way but do not disappear. 9. Remove the soup to a pan to reheat, adding a good grind of black pepper. 10. Garnish with roasted peppers, onions and a flourish of fresh parsley. 11. A tiny squeeze of lemon if you have one will sharpen the sweet flavours.